Intra-oviductal administration of RNA obtained from oviducts of estradiol-treated rats resulted in accelerated egg transport (Ríos et al., 1997). It is probable that estradiol-induced messenger RNA (mRNA) entered oviductal cells and was translated into the proteins involved in accelerated egg transport. In order to test this interpretation we deposited in vivo 50 µg of pure ß-galactosidase (ß-gal) mRNA, 50 µg of pure DNA from the reporter gene ß-gal under SV40 promoter or the vehicle (control oviducts) into the oviductal lumen of rats. Twenty four hours later the ß-gal activity was assayed in oviductal tissue homogenates using o-nitrophenyl-ß-D-galactopyranoside as a substrate. The administration of ß-gal mRNA and pSVBgal plasmid increased ß-gal activity by 71% and 142%, respectively, over the control oviducts. These results indicate that naked DNA and mRNA coding for ß-gal can enter oviductal cells and be translated into an active enzyme. They are consistent with the interpretation that embryo transport acceleration caused by the injection of estradiol-induced RNA in the oviduct involves translation of the injected mRNA. A single injection of estradiol (E2) on day 1 or 2 of pregnancy causes accelerated transport of embryos through the oviduct in rats 10 hours later (Ortiz et al.,1979). In a previous study we demonstrated that the intra-oviductal administration of total oviductal RNA obtained from E2-treated rats mimicked the effect of estradiol on the rate of egg transport seen following estrogen treatment in rats (Ríos et al., 1997). Our interpretation of this finding was that RNA enters the oviductal cells through an undisclosed mechanism and is translated into the proteins involved in accelerated egg transport. There is only one report of successful direct, in vivo injection of pure (naked) RNA molecules into muscle tissue (Wolff et al., 1990). On the contrary, several reports have been published on the use of DNA injection and other methods with successful transgene expression (Marshall, 1995; Tierry et al., 1995). In vivo transfection of DNA using cationic liposomes has been particularly studied in mouse uterus (Charnock-Jones et al., 1997) and oviduct (Relloso and Esponda, 1998, 2000). In order to test whether naked messenger RNA (mRNA) can enter oviductal cells and be translated, we attempted to transfect in vivo pure mRNA and DNA, both containing sequences encoding the reporter enzyme ß-galactosidase (ß-gal) into the oviductal lumen of rats and subsequently assessed ß-gal activity in the treated organ. ß-gal was selected , as it is not normally expressed in eucaryotes, and therefore the effects observed on ß-gal activity would not be attributed to transcriptional activation of endogenous DNA. Sprague-Dawley rats weighing 200-260 g were used. The animals were kept under controlled temperature (21-24ºC) and with lights on from 07:00 to 21:00. Water and pelleted food were supplied ad libitum. Vaginal smears were taken daily and pregnant rats were obtained as described in Ríos et al., 2001. Intra-oviductal administration of 50 µg of ß-gal mRNA transcript or 50 µg of pSVBgal supercoiled plasmid dissolved in 5 µL of RNase-free sterile saline was done on day 2 of pregnancy using a surgical microscope (OPMI 6-SDFC, Zeiss, Oberkochen, Germany). It was not possible to dissolve a greater amount of mRNA in 5 µL, the maximum volume that can be injected into the tiny space of the oviductal lumen. Control rats were simply injected with 5 µL of vehicle. A total of 14 animals were used: 4 were treated with ß-gal mRNA and 4 with its vehicle, 3 were treated with pSVBgal plasmid and 3 with its vehicle. Oviducts and ovaries were exposed through flank incisions made under ether anesthesia. Blood vessels in the periovarial sac were cauterized using an electric coagulator (Codman CMC-1, Codman and Shurleff, Inc., Randolph, MA, USA) before the sac was cut open to expose the fimbria. The RNA was injected bilaterally through the fimbria into the oviductal lumen with a micro-syringe as previously described (Ríos et al., 1997) and the plasmid DNA was injected with a 10 µL Hamilton syringe (Hamilton Company, Reno, NE, USA). The periovarial sac was replaced around the ovary, the organs were returned to the peritoneal cavity, and muscles and skin were sutured. The ß-gal RNA was transcribed from the plasmid pG1NT7Bgal linearized with Nae I (New England Biolabs, Inc., Beverly, MA, USA) in a reaction mixture containing 400 mM HEPES-KOH, pH 7.5, 120 mM MgCl2, 10 mM spermidine, 200 mM DTT, 5 mM GTP, 5 mM CTP, 5 mM UTP, 1.5 mM ATP, 3.5 mM m7G (5')ppp(5')A (New England Biolabs), T7 Enzyme Mix (Promega) and 10 µg of linearized DNA template. This mixture was incubated for 4 hours at 37ºC, and samples were precipitated with ethanol and 3.5 M ammonium acetate. Whereas capping the mRNA increases the stability (Furuichi et al., 1977), polyadenylation has only a small effect on the stability of synthetic transcripts over the first 24 h (Drummond et al., 1985). Furthermore RNase activity in the rat oviduct was found to be minimal (see below). For these reasons and as noted in a previous report (Wolff et al., 1990), we decided not to polyadenylate the transcripts to avoid compromising the final yield. ß-gal activity in oviductal tissue homogenate was assayed using the o-nitrophenyl-ß-D-galactopyranoside (ONPG, Sigma Chemical Co., St. Louis, MO, USA) as substrate. Twenty-four hours after intra-oviductal administration, rats were killed by excess ether inhalation and the oviducts were removed and cleaned of fat tissue. We chose to assay the ß-gal activity 24 hours after treatment because the effect of oviductal RNA obtained from E2-treated rats on egg transport was observed within this time frame (Ríos et al., 1997). Embryos were flushed out of each oviduct to avoid their possible contribution to ß-gal activity in oviductal homogenates. The two oviducts of each rat were homogenized in a Polytron homogenizer (KINEMATICA, GmBh, Luzern, Switzerland) for 10 sec in 1 mL of a buffer containinig 33 mM NaH2PO4, 66 mM Na2HPO4, 0.1 mM MnCl2, 2 mM MgSO4 and 40 mM ß-mercaptoethanol, pH 7.3. The homogenate was centrifuged for 10 min at 6000 rpm in order to remove particulate material. 800 µL of the clarified homogenate was incubated at 37ºC for 1 h with 200 µL of ONPG dissolved in the same buffer (4 mg/mL). The reaction was stopped by the addition of 500 µL of 1M Na2CO3. The sample absorbance was determined at 420nm and the ß-gal activity was calculated as follows: Units = (380 x A420 ) divided by time (in min), where 380 is a constant such that 1 unit is equivalent to a conversion of 1 nanomole of ONPG per min at 37ºC. Detection of ß-gal in oviductal tissue was attempted using a histochemical approach based on color generated by the product of a specific ß-gal substrate (Relloso and Esponda, 2000). Twenty-four hours after treatment, as indicated above, rats were killed by excess ether inhalation and oviducts were embedded in Tissue-Tek OCT compound (Miles Inc, Elkhart, IN, USA), frozen in liquid nitrogen and stored at -80ºC. Cryostat sections, 8-10 µm thick, were placed on silanized slides and fixed for 15 min in cold 4% paraformaldehyde dissolved in phosphate-buffered saline (PBS). Sections were rinsed twice in PBS and placed in 5-bromo-4-chloro-3-indolyl-ß-D-galactoside (X-gal , Sigma, St. Louis, MO, USA) staining solution (PBS containing 1 mg/mL X-gal, 5 mM K3Fe(CN)6, 5 mM K4Fe(CN)6, 2 mM MgCl2, 0.02 % NP-40 and 0.01% sodium deoxycholate) for 16-24 h in a humidified incubator at 37ºC. X-gal is a substrate of ß-gal that generates a deep blue color upon hydrolysis by the enzyme. Samples were rinsed twice in PBS prior to microscopic examination. The gut was used as positive control tissue, since it contains abundant bacteria rich in ß-gal. Ribonuclease activity in oviductal fluid was estimated and compared to that of other organs. Oviducts, uterine horns and a segment of ileum from rats on day 2 of pregnancy were flushed separately with 200 µL of RNase-free sterile saline. Flushings were collected and protein concentration was determined (Bradford, 1976). Five µg of a stock of total RNA were incubated with 50 µg of protein present in the oviductal, uterine or ileal flushings or with 10, 1 or 0.1 pg of RNase A for 15 min at 37ºC. As a negative control, RNA was also incubated with RNase-free sterile saline. The RNA integrity was examined in an agarose-paraformaldehyde gel. Results are presented as mean ± SEM. Non-parametric statistics were used because the data did not exhibit normal distribution. Means were compared using the Mann-Whitney test. Differences were considered significant when p<0.05. 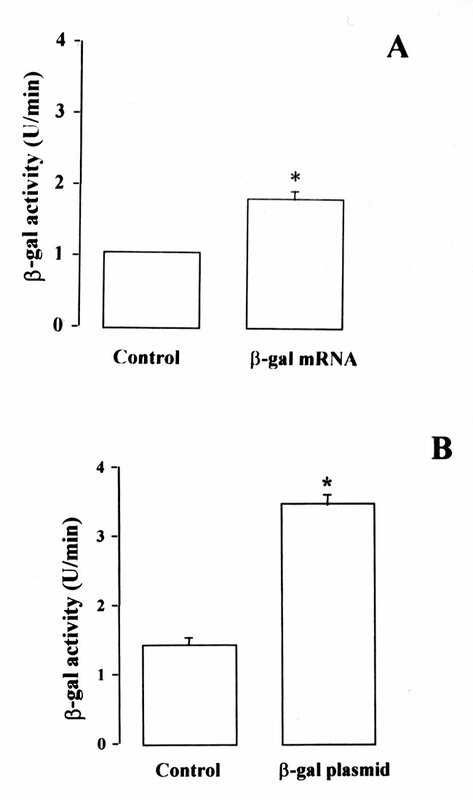 Figure 1A shows that the intra-oviductal administration of ß-gal mRNA increased ß-gal activity by 71% over the control oviducts (1.80±0.06 vs 1.05±0.03 U/min, mean ± SE), whereas when the pSVBgal plasmid was injected, the ß-gal activity increased by 142% over the control oviducts (3.47±0.22 vs. 1.43 ±0.20 U/min) (Fig. 1B). Control values are 36% higher in the second experiment than in the first (1.43 vs 1.05 U/min). Since the two experiments were independent and distant in time, this difference is in keeping with the expected variability. The differences found between each experiment and its corresponding control groups far exceeds the difference between the two controls, and there is no overlapping. It was not possible to localize ß-gal enzyme activity in the oviduct tissue using the histochemical assay. In contrast, the epithelial surface of the gut had a strong signal (not shown). Figure 2 shows that oviductal flushings partially degraded the RNA in contrast to the uterine and ileal flushings that degraded the RNA almost completely. By comparing with the RNase standard lanes we roughly estimated that the amount of RNase present within the oviductal lumen is less than 3 pg. Figure 1: ß-galactosidase (ß-gal) activity in oviductal tissue homogenate after intra-oviductal administration of ß-gal mRNA (A) or pSVBgal plasmid (B). Fifty µg of ß-gal mRNA or plasmid DNA were injected into the lumen of rat oviducts on day 2 of pregnancy. Twenty-four hours later, ß-gal activity was determined using OMPG as substrate. Results are expressed as mean ± SE of four and three independent experiments in A and B respectively. * Significantly different from control p<0.05. Figure 2: Agarose-paraformaldehyde gel showing the integrity of 5 µg of RNA after the incubation for 15 min at 37ºC with 50 µg of soluble protein present in the oviductal (A), uterine (B) or ileal (C) flushings or with 10 (E), 1 (F) or 0.1 (G) pg of RNase. As a negative control RNA was also incubated with RNase-free sterile saline (D). The present results indicate that naked DNA and mRNA coding for ß-gal, administered in the lumen of the oviduct are capable of being translated into an active enzyme. Current knowledge precludes the occurrence of extra-cellular translation in an in vivo system, and therefore injected products must have entered the cells. Since oviducts were flushed with saline injected through the lumen prior to homogenization, the enzymatic activity detected must have been linked to cells belonging to the oviductal wall, most likely the epithelial cells. The mechanism of entry of these polynucleotides into the oviductal cells has not been determined, but it is likely to be endocytosis. The lumen of the rat oviduct is a very small cavity that can accommodate an injected volume of 2-5 µL in the ampullary segment with visible distension of its mucosal folds. Following injection of 50 µg of mRNA or DNA partially suspended in RNase-free sterile saline, the epithelial cells come into contact with an extremely high concentration of this biological material, making it impossible to keep it entirely outside the cell if pinocytosis is an on-going process. An additional requirement for plasmid DNA is to reach the nucleus in order to be transcribed. Despite this fact, DNA is more stable than RNA, and that higher ß-gal activity was obtained following an injection of the plasmid is not surprising. Plasmid vectors containing the lacZ gene have previously been used to transfect mammalian cells, and the enzyme activity has been detected 2 days after electroporation (Yamazaki et al., 1998) and 7 days after microinjection (Wolff et al., 1990). A different situation is described here. DNA and mRNA were deposited into the oviductal lumen rather than being directly delivered into the cell or using other techniques that facilitate endocytosis. The amount of ß-gal activity detected was very small and it was not possible to localize the protein in the tissue by the histochemical assay using X-gal. Our interpretation is that due to the injection of naked DNA and RNA into the oviduct without penetration enhancer, the signal was too weak, and the minimal amount of enzyme produced only allows the detection of its activity under optimal conditions. Higher amounts of enzyme could probably be obtained if the RNA and DNA were administered in complexes with cationic liposome (Malone et al., 1989) or other carriers (Kleinschmidtm and Ederson, 1990, Van der Werf et al., 1986). RNase activity within the oviductal lumen was detectable, although at a lower level than in uterine or ileal lumen, and this may contribute to the modest response. If direct transfer of genes into human muscle in situ were successful, it would be conceivable that mRNA transfer could have several potential clinical applications. The injection of foreign, temporarily "corrective" mRNA into a tissue that can be repetitively accessed might be more useful than a non-reversible type of gene transfer, as it would be administered much like a conventional pharmaceutical product. The oviduct is a crucial organ for vertebrate reproduction. Fertilization as well as gamete and embryo transport occurs in the oviduct of mammals, birds and reptiles, and oviductal epithelial secretion has an important role in these reproductive phenomena. For these reasons, the possibility of transferring genes or RNAs to modify oviductal secretions, or the use of over-expressed sense and antisense DNA representing target genes, would be an interesting tool for future applications in reproductive biotechnology. The financial support of Fondecyt Complementary Lines Project #8980008, Presidential Professorship for H. Croxatto, MIFAB (The Millenium Institute for Fundamental and Applied Biology) and RF 98024#98 are gratefully acknowledged.